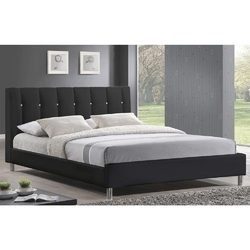 Grab some and count some sheep: get a good night's sleep in this Queen size Black Faux Leather Upholstered Platform Bed. The queen-sized modern bed frame is constructed with solid rubber wood, padded with foam and upholstered with black faux leather. Glittering faux crystal buttons dot the headboard for a touch of regality. Seeing that this is a platform bed and wooden slats are included with purchase, only a mattress is required. To clean, wipe with a damp cloth. This Malaysian-made contemporary bedroom furniture piece requires assembly and is available in both black and white in either full or queen size. Queen Bed Dimensions: 38 Inch high x 63.5 Inch wide x 88 Inch deep Footboard Dimensions: 12 Inch high x 63.5 Inch wide Height to top of slat: 8.75 Inch Height of legs: 6.5 Inch.